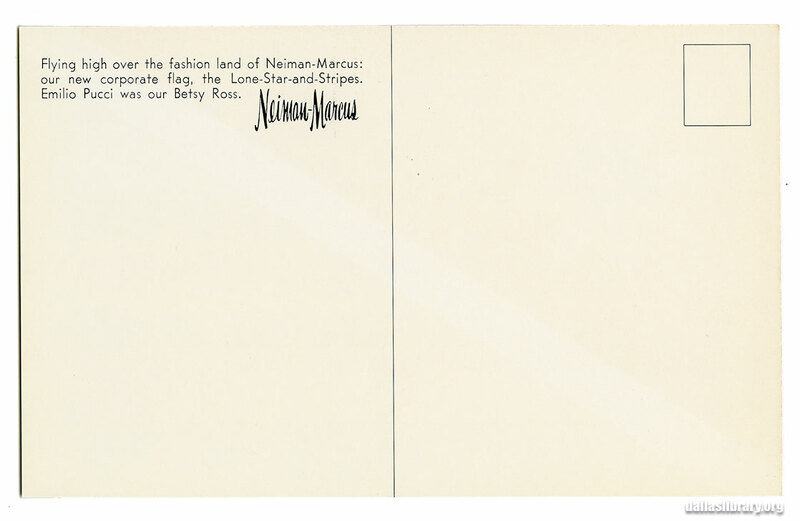 Flying high over the fashion land of Neiman-Marcus: our new corporate flag, the Lone-Star-and-Stripes. Emilio Pucci was our Betsy Ross. Betsy Ross and Emilio Pucci mentioned in the same breath! An 18th-century American seamstress who became a patriotic icon, and an Italian fashion designer whose vividly colorful, boldly patterned designs came to symbolize the youth and energy of the 1960s… talk about your strange bedfellows! 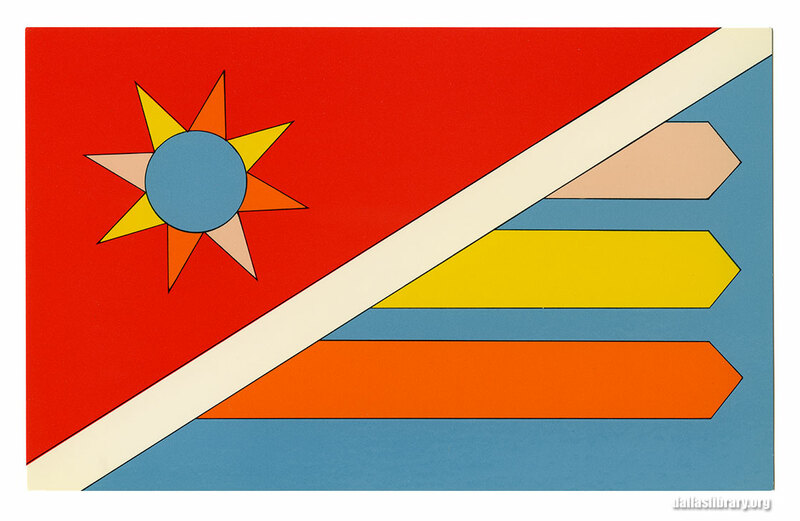 The only thing I could find about this unusually colorful flag was a brief mention in a Dallas Morning News fashion article about Neiman’s 28th Neiman-Marcus Exposition Award in early February of 1966. Gay Simpson wrote in The News that the luncheon centerpieces “carried the colors of the new Neiman-Marcus house flag. The flag, designed by Emilio Pucci, Italian couturier, has the colors of a Texas sunset dramatized with the Lone Star and stripes” (DMN, Feb. 9, 1966). There you have it. Who knew? As a postscript, any Dallas blog worth its salt cannot let a mention of Emilio Pucci go by without noting his main connection to the city: Pucci will forever be remembered as the man who brought outrageously colorful and super groovy mod designs to the stewardess uniforms of Dallas-based Braniff International Airways (designs so retinally exciting that they make that little Neiman’s flag look a little dowdy in comparison!). Did you see any pieces by Bjørn Wiinblad in the Neiman Marcus Collection? I’m not sure about the DPL collection, but I remember his name coming up when I was being shown items from the Stanley Marcus collection at the DeGolyer Library at SMU. Also, there should be a campaign to bring this flag back and hang it on the downtown store!